For on-trend sleepwear that transcends the seasons, browse the latest arrivals in adorable kids sleepwear. With nighties for the girls and matching pyjamas sets for the boys, we’ve everything you need to keep the kids cosy and well-rested. Nighties made from lightweight cotton will have the kids set for sleepwear in summer while matching sets fashioned in flanelette fabrics are the perfect pyjamas for winter. Made from comfortable cotton fabrics and fashioned in a variety of pastel prints, slipping into a plush pair of PJs will take the bedtime routine from burdensome to a breeze. 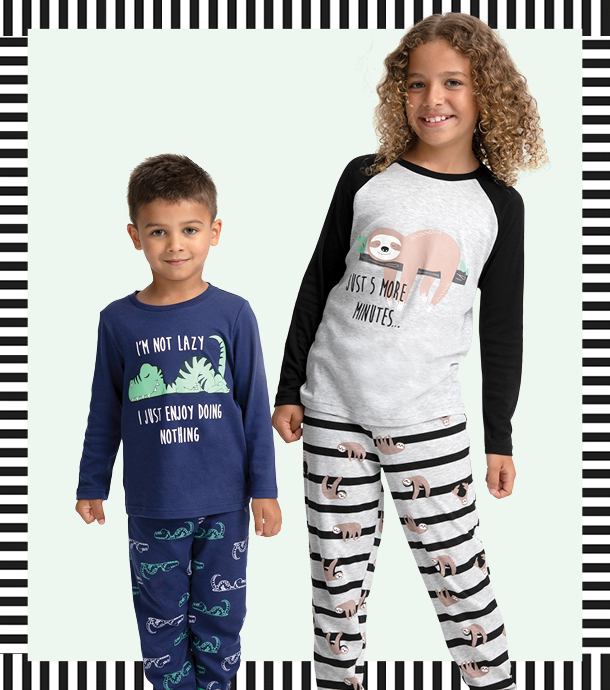 From sleeping sloths to daring dinosaurs, the new prints on our latest pairs of PJs will ensure that getting your boy ready for bed is a fun time for your family.